This post is brought to you in partnership with Kingfisher Bay Resort. You can book an amazing deal with them here. We’re extremely lucky to live on the beautiful Sunshine Coast here in Queensland, Australia. 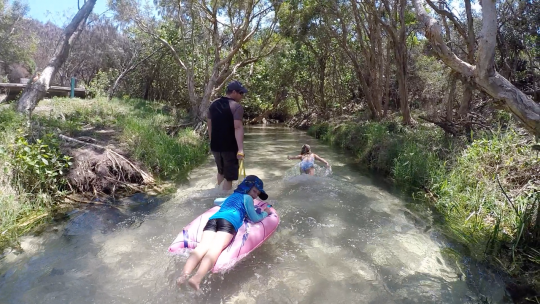 We are surrounded by natural beauty from the hinterland to the stunning beaches so it’s no surprise to learn that we (my family) love nothing more than being outdoors, playing and exploring in the natural world around us. 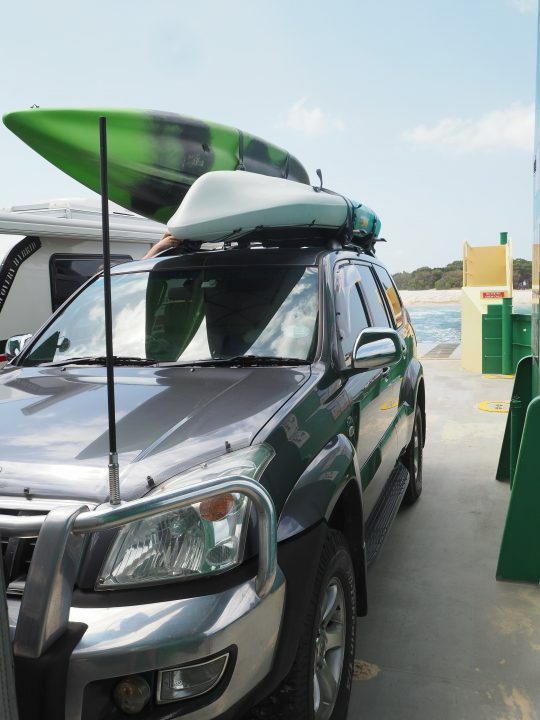 We’ve come to love 4 wheel driving with our young family and are blessed to have some pretty great locations close by, where we can put our driving skills to the test…none better than Fraser Island! 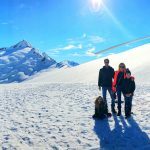 Fraser has been on the top of our adventure list for the past 8 years and we’ve created so many happy family memories on the Island. I find that every family I know who’ve visited has always returned again and again. Our 4 wheel drive heading to Fraser Island on the barge. 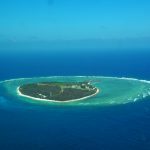 If you love adventure you will LOVE Fraser Island and what it has to offer…after all it is the world’s largest sand island! Even though we’ve been visiting as a family for the past 8 years we’re always finding new places to explore and learning more about the Island and it’s history. 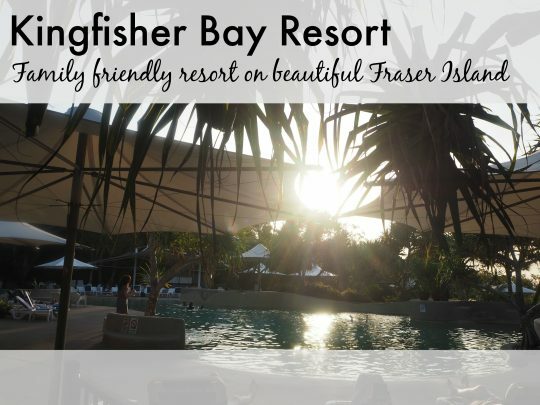 We were thrilled to be invited to stay at Kingfisher Bay Resort, we knew it would make for the perfect home base to explore more of the Island in our own 4 wheel drive, whilst also providing some fantastic family friendly activities to do within the resort itself. You’ll be happy to learn that you don’t need to own a 4 wheel drive to get the most out of your stay on Fraser Island, Kingfisher Bay Resort has a whole range of day trips and comfortable custom-designed, four-wheel-drive coaches to drive you to the most popular locations. You might decide to take the opportunity on Fraser Island to learn how to 4 wheel drive yourself with Australian Offroad Academy (they also do ladies only weekends!) or hire a 4 wheel drive through Kingfisher Bay Resort. 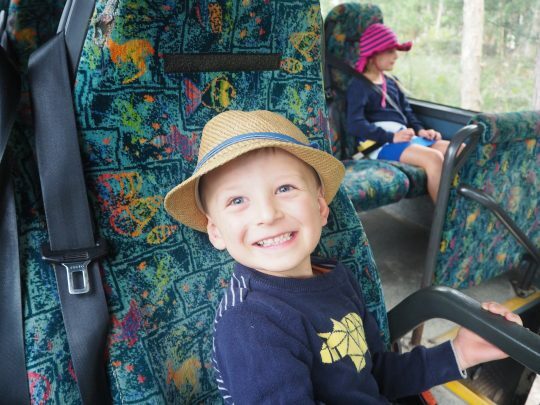 The kids had fun checking out the comfy Kingfisher Bay Coaches! 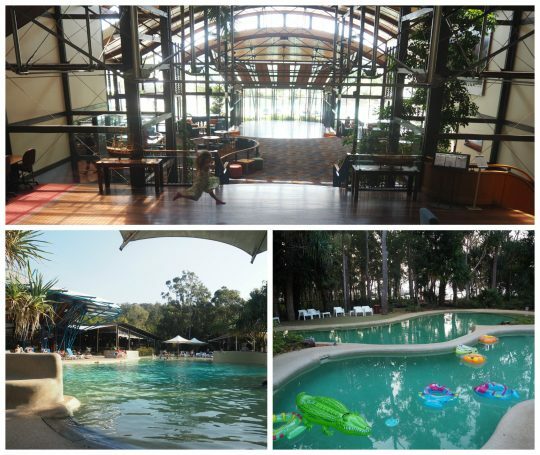 Did you know Kingfisher Bay Resort run a Junior Ranger Program for kids over the weekends and school holidays? I was lucky enough to get the opportunity to chat with Kingfisher Bay’s Head Ranger (Ranger Annie), who explained what they offer and why it’s proven to be such a successful program and why it’s ranked as one of the top 10 kid’s clubs in Australia. I’m always happy to see children excited to learn about nature in a hands on way…and the ‘icing on the cake’ is that they all get the chance to toast marshmallows around the fire whilst telling stories about the Island. 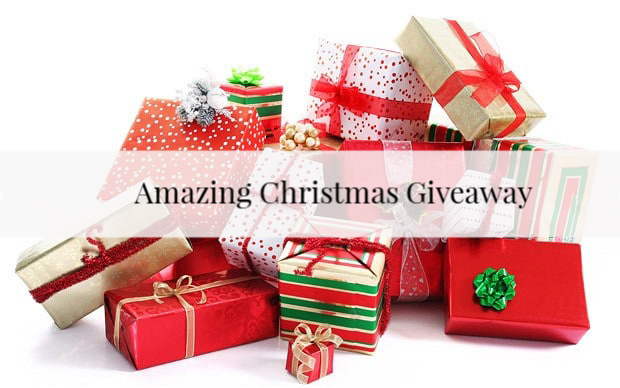 Talk about making wonderful holiday memories plus giving us parents a chance to enjoy a guilt free romantic dinner in one of their 3 amazing restaurants. You can read all about their Junior Ranger Program here. You can watch the ‘LIVE’ Facebook video we filmed with Ranger Annie here. 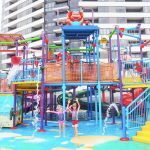 There are countless activities provided at the resort (some free and some at an additional cost)…if you can ever get the kids out of their TWO amazing resort pools!! There are over 20 Ranger-guided walks to choose from at the resort. 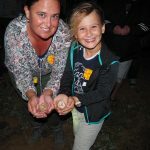 We took part in the Ranger-guided night walk and a Ranger-guided bush tucker walk – both were very educational and entertaining. 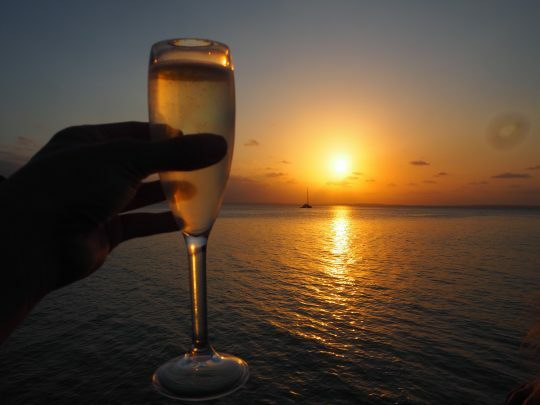 We spent every evening watching the amazing sunset over the Jetty at the Sunset Bar, the relaxed atmosphere was out of this world and something i wish I could’ve bottled up to bring home with me! We really enjoyed walking the jetty with the kids and spotting stingrays, squid, fish and even dolphins! 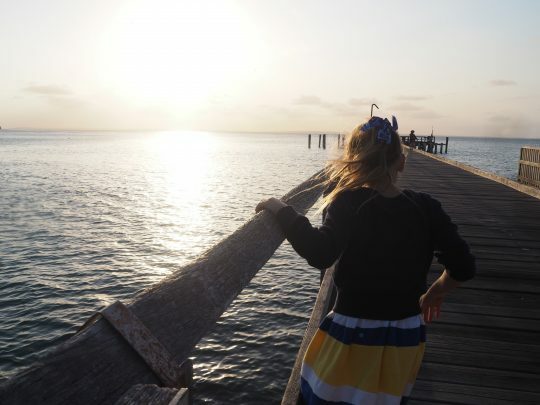 Miss 8 exploring the Jetty at Kingfisher Bay Resort. We had brought our own Kayak to explore the calm waters off the resort’s beach but you can hire an array of canoes and stand up boards from the beach hut. You can also book a guided canoe tour which I heard from other guests that it was amazing! If you head to the Island soon you can book a Whale watching cruise , they will pick you up and drop you straight back to the resort. The waters around Fraser Island are widely known for their amazing whale encounters! 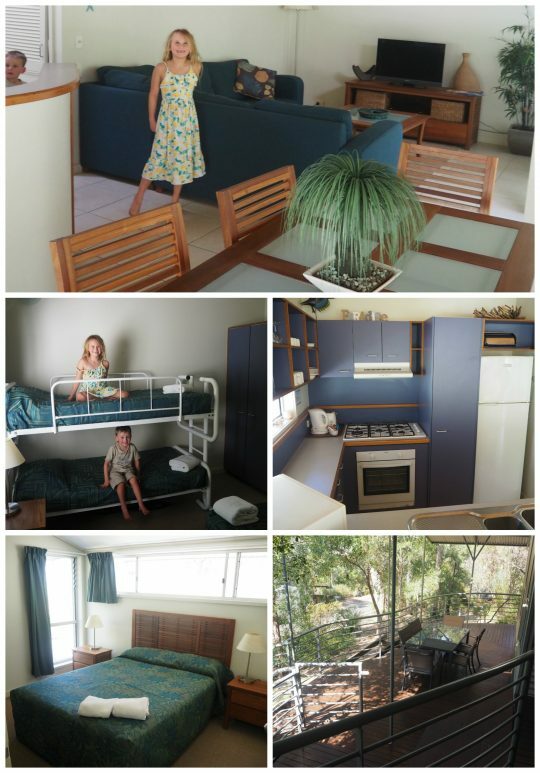 Our accommodation for the three nights was a beautiful fully self-contained villa set amongst the natural bush, just a short stroll from the resort. The villas are very spacious with two bedrooms, living, dining area and a large spa/bathroom…fitted out with all the creature comforts of home! I’m happy to report that there were two TVs that didn’t get turned on once! There’s just too much beauty around you to be distracted by TV or devices. In saying that though there is phone/wifi reception around the resort if required. We spent each day 4 wheel driving around the Island and our first day consisted of a visit to The Maheno Ship wreck and hours of fun in the crystal clear waters of Eli Creek. *Top tip, you can find some fish along the banks of the creek and if you’re lucky (or unlucky enough) to have a march fly land on you, you can feed it to the fish! Our second day saw us visiting another of Fraser Island’s jewels – Lake McKenzie. This place is something that simply must be experienced in person. The freshwater lake is a Perched lake, meaning it’s made of pure rainwater. 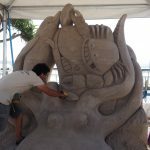 It’s surrounded by the most beautiful pure white silica sand which gives the water an amazing turquoise look as it’s shades grow darker vibrant blue towards the middle. You really shouldn’t visit Fraser Island and NOT see Lake McKenzie! A short drive from Lake McKenzie is a place called Central Station, not many of my friends who’ve been to Fraser Island have said they’ve visited here which is a real shame! 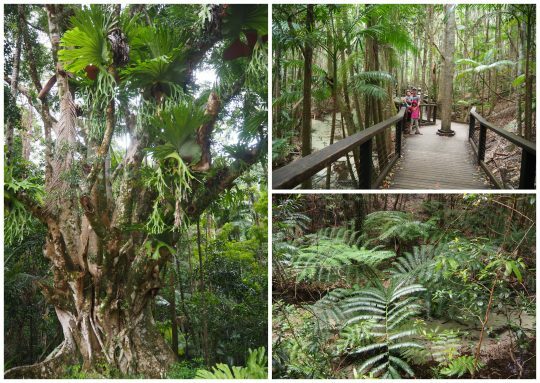 As you get closer to Central Station you start to notice your surroundings change, the trees grow denser as you enter a darker forest filled with mature Kauri Pines, Bunya Pines, Satinays and Flooded Gums that were planted 95 years ago to create a display botanical garden. There are also beautiful rare King Ferns that make you feel like you’ve stepped into Jurassic Park! There is an old school from the logging days and lots of interactive signs sharing the history. 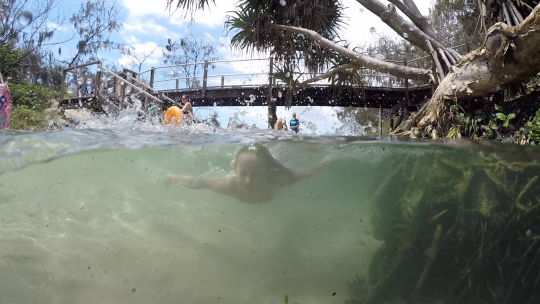 Here’s a little family movie I created sharing some of our adventures on Fraser Island. 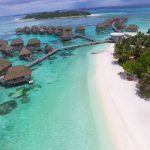 We felt that three nights was a great intro to the resort, however we would love to stay longer next time as there is just SO much to see and do around this fabulous family friendly resort and Island. 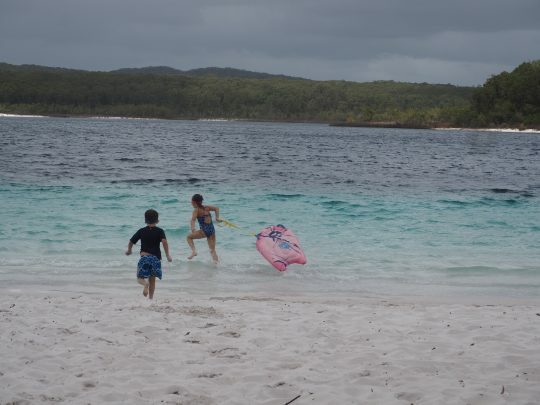 We truly believe that Fraser Island has so much to offer families and we can’t wait to continue to visit and make lasting memories with our children, and hopefully they will go on to someday holiday there with their own children in the future. For more information on Kingfisher Bay head here and and be sure to take advantage of the special they have on offer where you stay 3 nights and get your barge transfers for free! Be sure to follow them on Facebook here to stay up to date with any future deals and information.